Only two American girls were seeded in the Wimbledon Junior Championships this year, but those two and four others have reached the round of 16 by posting second round victories on Tuesday. The US boys fell short of last year's effort, when seven Americans reached the round of 16, but five did advance--all four seeds and Reilly Opelka, who eliminated No. 3 seed Corentin Denolly of France 6-4, 4-6, 6-4. Top seed Taylor Fritz posted a routine 6-1, 6-2 win over Sora Fukuda of Japan, and No. 4 seed Michael Mmoh also had no difficulty, taking out Nuno Borges of Portugal by the same score, with both matches taking less than an hour. Mmoh was fortunate to finish before a brief shower delayed most of the day's first matches for approximately 30 minutes. Despite threatening clouds, that proved to be the only disruption on a breezy and cool day at the All England Lawn Tennis Club. French Open boys champion Tommy Paul was taken the distance by Juan Jose Rosas of Peru, but the No. 7 seed picked up his play in the third set, taking a 5-0 lead and finishing with a 6-4, 3-6, 6-2 victory. No. 10 seed William Blumberg, who had played late into the evening on Monday before recording a three-set, come-from-behind win, had a more straightforward 6-4, 6-1 decision over qualifier Alberto Lim of the Philippines Tuesday. None of the five Americans will play a seed in Wednesday's third round. Fritz will play Franco Capalbo of Argentina, Opelka faces Yosuke Watanuki of Japan and Blumberg will take on qualifier Denis Shapovalov of Canada. Mmoh's opponent is Alvaro Lopez San Martin of Spain, and Paul meets John Nikles of Switzerland. Fritz has a win over Capalbo, but the other four matches are first-time encounters in ITF play. No. 2 seed Duck Hee Lee of Korea, who received his seeding based on his ATP ranking of 276, had to save a match point to survive the challenge of Australian Marc Polmans 6-7(6), 7-6(3), 9-7. Polmans twice served for the match, the first time at 5-4 in the second set. He didn't get to match point in that game, but broke with some solid net play to earn a second chance at 6-5. A good first serve at 30-all gave Polmans his match point, but he put a slice backhand into the middle of the net, and Lee won the next two points to get to the tiebreaker. Polmans lost the first three points there and couldn't recover, and Lee survived some close games down the stretch to eke out the win. 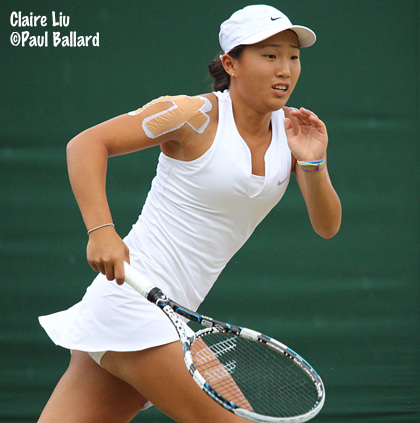 Claire Liu had an even more dramatic match point save in her 5-7, 6-2, 7-5 victory over Evgeniya Levashova. With Levashova serving for the match at 5-4 in the third, Liu failed to convert three break points and the 16-year-old Russian finally got the advantage. Liu played several aggressive ground strokes and ultimately forced Levashova into a off-balance defensive lob that appeared to be headed well beyond the baseline. Liu let it go, but a wind gust nearly kept it in. When the ball landed, the line umpire made the two-handed good signal, but the chair umpire overruled the call and play continued, despite Levashova's protest. "On the match point I was trying to be aggressive because I knew she was going to be nervous," Liu said. "So I kept just trying to pressure her and I came to net. She hit a ball and I thought it was going way out, but the wind brought it in or something. It was really close. When she(the line judge) called it in, I went like, are you serious to the umpire, and he said it was out. I thought that she was probably super-mad right then, so I had to win the next one and then I played a lot better." Liu hit two forehand winners to take the game and then saved a break point in the next game with a good first serve. Levashova got to 40-15 serving at 5-6, but her first serve deserted her and she also double faulted twice. Liu couldn't convert on her first two match points, but she got the third when Levashova's forehand went wide. "She is really hard to play," said the 15-year-old Liu, who had lost to Levashova in the third round of the Eddie Herr last year. "She has a really good serve, especially first serve, and you can be up 40-0 and she can like serve three good serves and there's nothing you can do. I was just trying to get the first return in and trying to stay aggressive, and maybe come to net, but I didn't have to." Liu will play wild card Tornado Alicia Black in the third round, the only Wednesday match that features two Americans. Black, a quarterfinalist last year, cruised past Maia Lumsden of Great Britain 6-1, 6-1 and has lost only five games in her first two matches. "I've never played her," said Liu, who said she has no experience with Black's game, not even in a practice setting. "She's really good. I've heard she's a really good mover, a really good competitor. I'll just try to keep playing my game." Caroline Dolehide advanced to the third round with a 6-4, 6-2 win over Olivia Tjandramulia of Australia and will play qualifier Viktoria Kuzmova of Slovakia, who beat Raveena Kingsley 4-6, 7-6(2), 6-4. No. 6 seed Usue Arconada reached the third round with her second straight three-set win, beating qualifier Lucia Wargnier of France 6-3, 2-6, 6-4. Arconada's opponent Wednesday is No. 12 seed Anna Blinkova of Russia. No. 9 seed Sonya Kenin defeated Jil Teichmann of Switzerland 7-5, 6-4, overcoming the rain delay, which stopped play when she was serving up 2-1 in the second set. "It was tough when the rain started," said the 16-year-old, who said she had targeted Teichmann's backhand to get the advantage. "I was up 40-15, and I closed out the game. At that point her backhand was all of a sudden really good, so at that point she didn't have a weak spot at all. So I somehow just had to fight and find a way to win." Kenin will play Katie Swan of Great Britain, who at No. 5 is the highest seed remaining in the girls draw. Kenin and Swan, who lives in the US, have played doubles together and are friends, but Kenin said she will put that aside on Wednesday. "I know the Great Britain crowd is going to be behind her and I'll probably be on the big courts, 4 or 14 (the match is scheduled for show court 18)," said Kenin, who lost to Swan at the Eddie Herr last year. "Yes, she's my friend, but on court, we're not friends. On court is completely different. You just fight and try to win and off court you're friends." The sixth US girl in the third round is Michaela Gordon, who defeated No. 15 seed Pranjala Yadlapalli 6-2, 6-3 in the day's last singles match. Gordon, who reached the quarterfinals last year, did not play on grass prior to Wimbledon due to a wrist injury suffered during the Sumter $25,000 Women's Pro Circuit event last month. "It's been fine this whole week," said Gordon, who will turn 16 later this month. "I just tape it as a precautionary thing, because it was hurt like two weeks ago. I wanted to play Maureen Connolly (Cup) and then Roehampton and Wimbledon, but I couldn't do it." Fortunately for Gordon, she needs only a few practices to feel comfortable on the surface. "I don't have very much trouble adjusting to grass," said Gordon, who was broken only once in her win Tuesday evening. "After a few days of practice, usually I feel pretty good. I really like how it plays, how it bounces. It fits my game style and I'm trying to be more aggressive with my game, and I think it really helps if you're more aggressive on grass and moving forward into the court." Gordon's opponent is 15-year-old Olesya Pervushina of Russia, who defeated No. 2 seed Shilin Xu of China 6-3, 4-6, 6-3. "I'm not really sure how she plays," Gordon said. "I think some of my friends know how she plays. But I try to focus more on how I'm playing and doing the right things, because that's been working pretty well for me so far." Fifteen first round doubles matches were played on Tuesday, with the 17 remaining first round matches scheduled for Wednesday. Top seeds Marketa Vondrousova and Miriam Kolodziejova of the Czech Republic, who are seeking the junior grand slam in doubles, have cleared the first hurdle at Wimbledon, beating Kenin and Jacqueline Cristian of Romania 6-1, 6-0. No. 2 seeds Yunseong Chung and Seong Chan Hong of Korea lost to Yusuke Takahashi and Jumpei Yamasaki of Japan 7-6(3), 2-6, 6-3. The draws are here and the order of play for Wednesday is here. Any news about Team USA boys playoff? - Alafia Ayeni def. Matthew Tsolakyan 6-1 ret. Colette, what is the benefit of earning a place on Team USA? Where will they be competing?